A common concern from parents and seemingly one of the biggest fears for daycares in Montgomery County is ‘Pink Eye.’ We get tons of calls and visits each year for eye discharge, goopy eyes, red eyes, swollen eyes, or ‘daycare says my child has ‘Pink Eye’ eyes. I am here to tell you that not all red eyes are created equal and that ‘Pink Eye’ is not as scary as daycare may makes it seem. True ‘Pink eye’ is actually something called bacterial conjunctivitis. This is an infection of the inside of the eyelids (conjunctiva) caused by one of a handful of bacteria. Most of these bacteria live on our skin everyday but can stir up a little bit of trouble when they get into places they are not supposed to be… like the conjunctiva. When an infection occurs, they cause the symptoms you expect with ‘Pink Eye’; thick yellow eye discharge, crusting of the eye lashes in the mornings, redness of the eyeballs and eyelids, swelling, and discomfort. The bad news about bacterial conjunctivitis is that it is uncomfortable and very contagious – hence the concern from daycares. Good hand hygiene and avoiding direct contact with the eye discharge is the best way to limit spread to you and others in your house. The good news about bacterial conjunctivitis is that in most cases it will get better on their own or are easily treated with a few days of an antibiotic eye drop. As I’ve alluded to, however, not all reds eyes are ‘Pink Eye.’ In fact, only about half of the red eyes that we see are bonafide bacterial conjunctivitis. The others half are caused by things like a virus, allergies, or even a stuffy nose. And, importantly, these other causes do not require an antibiotic eye drops or time home from daycare or school! 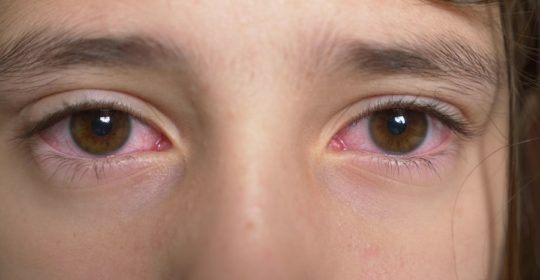 Viral conjunctivitis is the second most common cause of red eyes. It is caused by a virus, rather than a bacteria, getting into the conjunctiva. The symptoms of viral conjunctivitis are very similar to bacterial conjunctivitis and they can be hard to tell apart (even for us!). A few of the classic differences that can help distinguish the two are that viral conjunctivitis is almost always in both eyes, it less commonly causes the eyes to be ‘glued shut’ in the mornings, and is almost always associated with other cold symptoms like a runny nose, congestion or cough. As with most viral infections, viral conjunctivitis will run its course and get better on its own. Your child does NOT need any antibiotic eye drops if this is the case. Allergic conjunctivitis is caused by seasonal allergens like pollen, ragweed, grass, etc. This one is particularly common during this time of year so keep it on your radar! This is an irritation, rather than an infection, caused by you child’s body’s response to these allergens. It, too, can look similar to the others but also has a few qualities that can help you distinguish it from classic ‘Pink Eye’. First, the season and an underlying history of allergies are a big clue. Second, it usually causes very itchy, watery eyes while the others do not. And, finally, is usually associated with other allergy symptoms like sneezing, itchy throat, or sniffles. We treat this one by addressing the underlying allergy with an antihistamine medicine (like Claritin, Zyrtec, or Benadryl) and an allergy eye drop if symptoms are really bad. Allergic conjunctivitis is not contagious and shouldn’t keep your child home from daycare or school in most cases! Last, but not least, there is what I will call ‘overflow’ eye discharge. Your nose, ears, and eyes are all connected. They each drain through your nose into the back of your throat (this is why you get a runny nose when you cry!). When everything is status quo this system works really well. Your eyes make tears and other good lubricating mucus everyday that make their way through this drainage system without you noticing. Problems arise when you get a cold or a stuffy nose. This blockage causes a traffic jam for your normal ear and eye drainage. All those tears and good mucous from the eyes now have nowhere to go! It starts to pile up in the tear ducts and in the eye itself leading to eye puffiness and goopy discharge. The treatment for this is to unclog the nose and restore the normal drainage system in the face. Nasal saline rinses, blowing/suctioning the nose, humidifiers, warm compresses to the eye, tear duct massage, and some good ol’ ‘tincture of time’ usually do the trick. Not all red eyes are ‘Pink Eye.’ As you can see there are a lot of different reasons for eyes to get red or goopy and they are all treated a little differently. Your child may not need antibiotic drops. When we don’t offer antibiotics it’s not because we are stingy. It’s because we think your child’s eye problems are due to bacterial conjunctivitis. Unnecessary antibiotics we use leads to higher the risk of antibiotic resistant bacteria. If this happens, ‘Pink Eye’ really will be something to worry about! A few signs that are always concerning for which we would definitely want to see your child: redness or swelling that is spreading out from the eye, pain with eye movements, eye pain with bright lights, inability to fully open or close the eyes, or if one eye is ‘popping out’ more than the other (I doubt this this one need to be explicitly said). When in doubt – contact us, we are here to help! We can talk through the problem on the phone, look at a few pictures, or bring your child in the office for a close look. Call us at 301-279-6750, chat us at potomacpediatrics.com, or email us at advicenurse@potomacpediatrics.com.